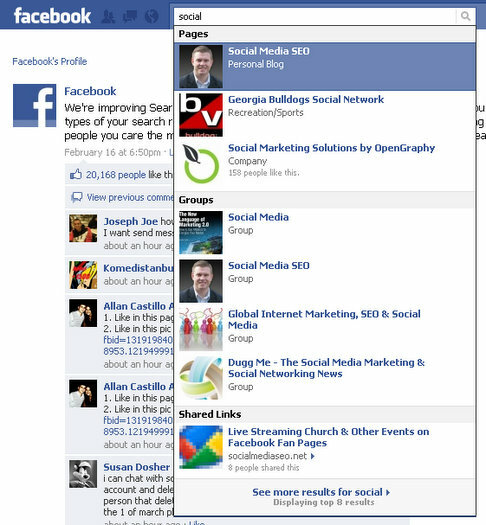 Have you noticed the new search results functionality on Facebook? The search results that appear as you type into the Facebook search bar (you know, the ones that appear immediately…) are now being grouped by “type”. For example, as you’re typing into the search bar, you will search results appear grouped by Pages, Groups, People, and even shared links – and these results will, as always, be tailored toward what you care about the most. Facebook made the announcement last week on February 16th. This new move shows that Facebook is serious about search, and we could see Facebook start to creep up on some of the market share that is now dominated by Google. Now before you get ready to hang me, I am not implying that Facebook search is anywhere near the market of Google, I’m simply saying that with Facebook’s real time search and now the grouping by type, results are becoming more and more customized to the individual user. And certainly, the longer the more than 500 million users engage and share information on Facebook, the smarter that search engine is going to get. Right now Google has to crawl and index data for its search results – Facebook has its data fed to it, directly from the users – which is something that Google is seriously lacking. So… under the “shared links” it says “8 people shared this” – is there anyway to find out who those eight people were? friends that have shared a link.